On April 8, 2000, Mark Hogancamp was attacked outside of a bar in Kingston, NY, by five men who beat him literally to death. Revived by paramedics, Mark had suffered brain damage and physical injuries so severe even his own mother didn’t recognize him. When he emerged from his coma nine days after the attack he could barely walk, speak or remember anything from his previous life. Less than a year later, Mark’s state-supported physical, cognitive and occupational therapies ran out. He was 38, broke, living in a trailer and unable to work. And he was angry. He realized he had two choices: he could give up and “let those five guys win,” or he could take control of his own recovery. Mark started to look through his old journals to piece together his life. Some of what he found was upsetting – he’d been a mean alcoholic who drove away his first wife, Anastasia. But he also discovered a talent for art and an old love of models and toy soldiers. And that is where Marwencol was born. Marwencol is a fictional World War II-era town somewhere in Belgium (but actually located in Mark’s backyard). It’s a sort of 1/6th scale demilitarized zone, populated with both Nazi and Allied forces, all of whom must abide by the town’s one rule: inside the walls of Marwencol, they must all get along. 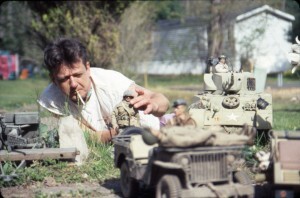 Los Angeles documentary filmmaker Jeff Malmberg has just completed principal photography on MARWENCOL, telling the story of Mark and his fantasy world. As Mark developed stories in the fictional town of Marwencol, he started documenting them through photography. What could have been flat tableaus were transformed through Mark’s artistic eye into rich, cinematic scenes that deftly hid the imperfections of the dolls and brought the plastic figures to life. In the process, Mark has had to face many of his demons. Produced by Malmberg, along with Tom Putnam, Chris Shellen, Matt Radecki and Kevin Walsh, this unique documentary focuses on the subjective nature of reality.